Lightweight Mobile Studio for Composite / S-Video front 82x58 DATAVIDEO MOBILE STUDIO case 82x58 DATAVIDEO MOBILE STUDIO back 82x58 DATAVIDEO MOBILE STUDIO Switcher and Studio Kit Available switcher studio kit datavideo us DATAVIDEO MOBILE STUDIO is also available as a solitary studio switcher or as a studio kit, the Studio Kit, respectively. 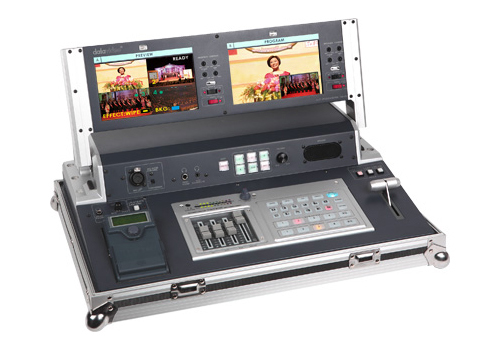 is a light weight hand-carried solution for transporting and using a Datavideo switcher and a dual screen monitor as one unit. The dual screen monitor is pre-wired to use one screen for selectable quad-view of each source and the other screen for program output. It’s perfect for applications within education, houses of worship, internet streaming, live events, conferences and more. Outputs include: component (YUV) which could be connected to a DVD recorder or projector. As with all Datavideo products, works on 12vDC or local power.